LAST Sunday the Bosnian community staged an impressive foundation laying ceremony for the building of the new Islamic Centre in Eight Mile Plains. The event opened with Quranic recital by Qari Salih Mujala, followed by an opening speech by Sister Mirsada Hadziahmetovic, the Master of Ceremony, who conducted the event with charm and dignity. 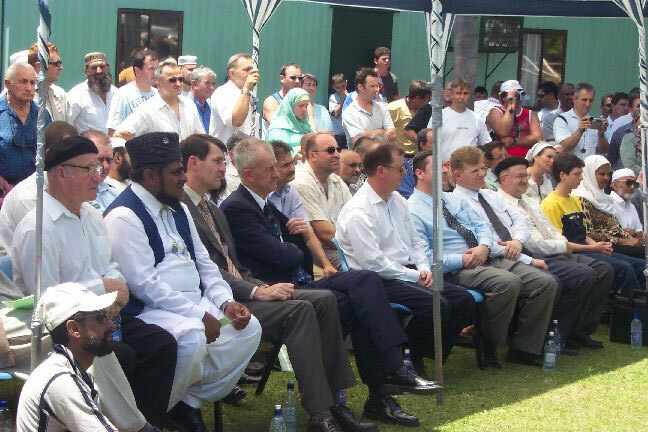 Some of the dignitaries and other Muslim officiates who were present included, Stephen Robertson, Minister for Health; Federal Minister Gary Hardgrave; the President of the Islamic Community of Bosnia and Hercegovina; Ray Deen; Sultan Deen; Abdul Jalal, the President of ICQ; representatives of Brisbane City Council, the Member for Wishart and Imam Abdurahman Rayne. 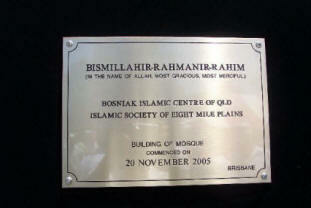 This event was not only significant because of the building of the first Bosnian Islamic centre in Queensland. It represented the culmination of the perseverance and achievements of the Bosnian community who strived against much adversity to establish and maintain their Islamic identity here in Australia. The President of the Islamic Society of Eight Mile Plains (aka the Bosnian Islamic Society), Ahmed Elijazovic, gave a moving speech about the history of the establishment of the society here in Australia. The Bosniak Islamic Centre of Queensland was first established in 1986 by a small number of Bosnians who had migrated from their motherland. 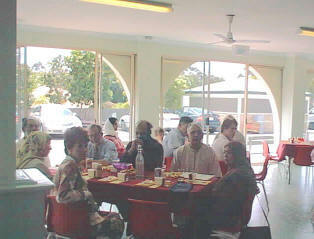 Out of this organisation, the Islamic Society of Rochedale was formed in 1987. As a result of the brutal war that had taken place in Bosnia between 1992 and 1995 which had claimed more than 200 000 lives, many thousands fled their homeland and found refuge in Australia. Due to the large influx of people to Australia, the establishment of the Bosniak Islamic Centre in Eight Mile Plains suffered a serious setback as a result of the need to divert the funds to support the new migrants and refugees to Queensland and other parts of Australia. However, as the number of migrants grew the membership of the Islamic society of Eight Mile Plains grew as well. Currently they have a membership of over 400 families. It is the hope of the society that the new construction will not only provide a place of sanctity for the Muslim community but a place where families can meet for sporting and other social events. The Imam of the Masjid, Imam Sifet Omerovic was, back in his own country, the equivalent of a Grand Imam who had the enormous task of overseeing 36 other masjids. Imam Sifet moved to Australia four years ago with his wife and three children. He had this to say..."Australia gave them (migrants) their lives back, it gave them security, education, material prosperity and personal happiness. These are gifts we should never forget... We owe them to this beautiful land of Australia which we now call our home." Particular mention must be made of the efforts of Ray Deen for 'bulldozing' his way through bureaucratic obstacles to get the society to this crucial stage of the development. The Deens are stalwarts in the Muslim community who supported the establishment of the first mosque in Queensland in 1907 (Holland Park) and continue to do this to this day. The Bosniak Islamic Centre has been no exception. [Editor] CCN wishes the Society all the best with the construction of the new Masjid and our duas are with them. 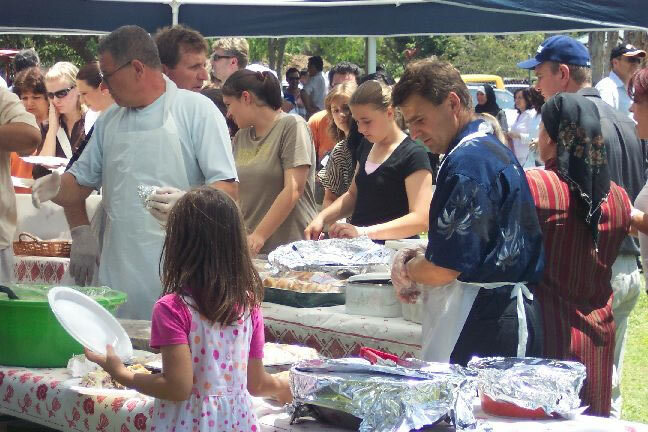 The Bosnian Islamic Society are gladly accepting donations from the Muslim Community. Please support them in whatever way you can. The Sydney Multicultural Eid Festival and Fair (MEFF) was held on last Sunday (20 November) at the Fairfield Showgrounds. Our Man-on-the-Mussallaah took a plane from Brisbane down to Sydney and then three trains, a bus and a taxi to get to the grounds to bring you these photos and video clips. Last year's MEFF took the award for Event of the Year ahead of Crescents of Brisbane's CresWalk. No, this is not about the highly addictive British cop series on the ABC every Tuesday and Saturday nights. Rather it's in reference to the somewhat frenzied activity that has gripped the community over the past few days to provide comment to the Queensland Government as it takes steps to introduce the controversial Terrorism (Preventative Detention) Bill. If you have not had a chance to get into the act then unfortunately you have missed the deadline for reviews and comments which was on Friday. But you can get up to speed with all its implications by studying the Bill and the explanatory notes. The Islamic Council of Queensland is hosting a workshop today (Sunday 27 November) at the Darra Mosque to formulate strategies for addressing six key areas identified by the Federal Government and its Muslim Reference Group. These issues include Crisis Management, Family, Training of Clerics, etc. The workshop is open to anyone who would like to contribute to the development of the sets of proposals which will identify the needs and aspirations of the Muslim community here in Australia. Johnny Clegg is a singer, songwriter, qualified anthropologist, dancer and musical activist whose infectious crossover music, a vibrant blend of Western pop and African Zulu rhythms, exploded onto the international scene - breaking through many barriers, particularly in South Africa. Johnny Clegg's history is as bold, colourful, and dashing as the rainbow country which he calls home. For more than three decades, Johnny Clegg has sold many thousands of records in South Africa, Africa, Europe, the USA and Canada. He has wowed vast audiences with his audacious live shows and won a number of domestic and international awards for his music. He has been recognised internationally for his outspoken views on apartheid, his perspectives on migrant workers in South Africa and the general situation of the world today. He is an eloquent speaker who tells a fascinating account of how countries face a natural dilemma by participating in globalization and at the same time holding on to cultural values. In the last issue of CCN we reported on the experiences of Abulfadl Mohsin Ebrahim, Professor of Islamic Studies, School of Religion and Theology, University of KwaZulu-Natal, Durban on his recent visit to Uzbekhistan. The good professor will be visiting our part of the world in December and will be delivering talks on his areas of specialty at the Darul Uloom on 11 and 12 December. Click here for a programme brochure and contact Hanief Khatree at m.khatree@uq.edu.au for more details. NOT being an aficionado of Hindi/Bollywood style music (having been brought up on an eclectic diet of Jimi Hendrix, Cream, Janis Joplin, Santana, Stevie Wonder, Marvin Gaye, The Four Tops, Smokey Robinson & the Miracles, The Temptations, Led Zeppelin, Pink Floyd, Elton John (particularly the LP Mad Man Across the Water), Aretha Franklin, Crosby, Stills, Nash and Young, the Beatles, Rolling Stones, Simon and Garfunkel, James Taylor, Carly Simon, The Supremes, Four Tops, The Jackson Five and dare I say it even Cliff Richard and Elvis Presley, and more recently Eminem, Black Eyed Peas and The Three Tenors) I found I had ample time to focus on, and analyse, the sensual and suggestive movements of the main (female) protagonists (for purely academic reasons of course). When the Japanese lifted ideas from the West they improved on them tenfold before they put them out on the market. When Indians 'borrow' them from the West (and most of what I saw on stage was an unashamed rip off of Michael Jackson’s brilliant groundbreaking Thriller video) they exaggerate them to the point of caricature. A large percentage of the audience was White, evidently another of the many side effects of all that outsourcing of IT and Call Centres to Bangalore and Bombay. After all, when you are put on hold these days, instead of bland Mat Monroe elevator-type music you are more likely to get to listen to the likes of “You are my Sonia” and “Kabhi Khushi Kabhie Gham” forcing you into involuntarily pretending to simultaneously screw in a light bulb with the one hand while wiping a table with the other (not unlike that very funny dole queue scene from my number one movie of all time - The Full Monty). According to the ladies by my side the men matched the women in every department and many of them are still reeling from the first-time discovery that Indian men endowed with six-packs is neither an oxymoron nor the genetic impossibility that their husbands and fathers have led them into believing all these years. (PS. In the light of the many odious comparisons being bandied about on the night, and, I might add, ever since, I have renewed my Fitness First membership for another six months – so watch this space). Queenslanders will have just missed out on another Bollywood production that played last night in Melbourne and on Friday in Sydney (and, I fear, won't be making the rounds to Brisbane). Titled Bollywood Encore the show boasts a live orchestra with Arjun Rampal, Mahima Chaudary, Tulip Joshi, Aryan Vaid, Sonu Kakkar, Preeti Jhangiani, Jnr Kishore and Sikander as the stars. To see what you might have missed out on go to www.bollywoodencore.com. The November edition of the Queensland Muslim Times is now out. If you did not get to pick up a hard copy from your Mosque or Muslim-owned business outlet, then you can read it online by clicking here. In light of the plight of the Islamic Society of Ipswich (as highlighted in the last issue of CCN) a meeting has been planned to discuss strategies to assist the Society out of its predicament. The Society needs a further $170 000 to be raised by end of December to pay for the old church site which will serve as the new prayer facility at Ipswich. Anyone who would like to assist in the furtherance of this cause is welcome to attend. 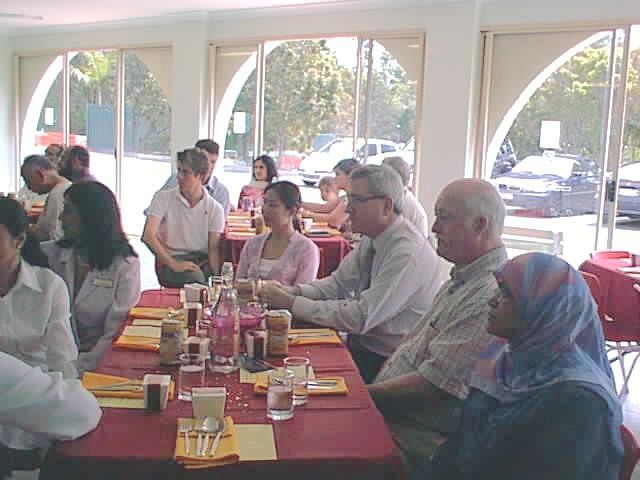 A few weeks back the Islamic Womens' Association of Queensland (IWAQ) hosted a lunch for Andrew Bartlet, Queensland Democrat Senator and Ian Barton from Department of Immigration and Multicultural and Indigenous Affairs. Corinne Anderson, the Hon Karen Lee of the Australian and Gold Coast Councillor Rob Molhoek and the Hon Peter Lawlor MP along with many others were also in attendance. Imam Imraan Hussein of the Gold Coast Mosque showed the guests around the Mosque and demonstrated how prayers were conducted and explained the history of Islam. President of the Islamic Council of Queensland, Abdul Jalal gave a speech and many of the women present spoke of how Eid was celebrated in the countries of their origin. By all accounts a fine and productive time was had by all. Time for another chance to win a Nandos Fiesta voucher. This time it's Nandos Broadbeach which has kindly sponsored a Fiesta valued at $16.50. The question is this: What is Nelson Mandela's Xhosa name and what does it mean? First correct entry randomly drawn from the CCN Inbox wins the voucher. Send your answer to theteam@crescentsofbrisbane.org. Entries close midnight Friday 2 December. The holiday season is upon us and you'll no doubt be making a few trips down to the Gold Coast in the coming months. Win the prize and you'll make the trip even more worth the while. Remember if you're not in it, you simply can't win it.